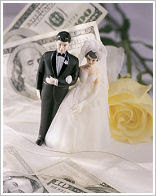 In the words of John Lennon, “money can’t buy me love.” But money may lead to divorce. According to a study by the Creighton University Center for Marriage and Family, money is a leading reason couples fight and one of the main causes of divorce. If you’re planning on tying the knot anytime soon, now is the time to sit down with your groom-to-be and go over your finances. Here are a few tips to make sure that money doesn’t get in the way of "happily ever after." Discuss and set long-term goals. Be open and honest in discussing your finances. Determine what is important to both of you, and agree to work together to accomplish your goals, whether they include paying off your debt, saving for a down payment on a home, or retirement planning. If you’re both on the same page for your long-term goals, you’re less likely to argue about short-term spending. Determine how you will handle the day-to-day management of your finances. Often one spouse will be more inclined to manage the finances. That’s fine, but make sure that both are aware of what’s going on. Create a plan outlining what you are going to do with the money you earn. Use a secure online spending management program like Mvelopes Personal (www.mvelopes.com) to automate your plan and make tracking easy. Use online bill pay to set up automatic transfers into a savings account to make saving simple. You can also set up automatic payments on your mortgage, car payment, credit card, or just about any other bill to avoid late payments (and the accompanying arguments). Most banks offer online bill pay and Mvelopes includes a free online bill pay service. Set aside some “fun money” to cover the occasional impulse buy. Most budgets fail because people feel constrained by them. If you have some wiggle room, you’re much more likely to stick to your plan. Some couples prefer a “his spending” category and a “her spending” category – that way, so long as you have the money in your category, you can get those perfect shoes when you find them, without feeling guilty. And he can get that new golf club. Start planning for your future…NOW. This may be the most important thing you can do for yourself. Your wedding should be the start of a wonderful life together, but if you really do want to live happily ever after, you need to start planning for tomorrow today. Set aside some money in your spending plan for a retirement account. Contribute to a 401(k) or set up an automatic transfer to an IRA. Time can be your biggest ally, or your worst enemy. The sooner you start, the easier it will be. Start today. Start now. Money isn’t everything, and discussing your finances now won’t necessarily ensure that you’ll end up millionaires, but it may help avoid arguments later on. According to a study by economists David Blanchflower and Andrew Oswald, married people are healthier, both physically and psychologically, they live longer, they earn more money and they’re happier. In fact, about $100,000 per year would be needed to compensate for the happiness achieved through a lasting marriage, according to the study. And isn’t that why you’re getting married in the first place…to live happily ever after?